Summer makes it easier and necessary to rise early, go out and get back before the heat kicks in. – Spent the entire weekend dog-proofing the yard and yet ironically nearly lost Bodhi when he took off through an open gate this morning. The great thing was he came back when called. At least I got a few minutes to myself as the sun was setting and there was some terrific backlight to work with. While this isn’t the prettiest Autumn leaf they all end up this way eventually. One of the mistakes I still make occasionally is pressing the shutter button before thinking things through and making some choices and changes. Sometimes I can justify this because the subject presented itself unexpectedly and is not going to wait for me or the choices are limited. Otherwise it is all down to me. I want to share a “mistake” I made recently. 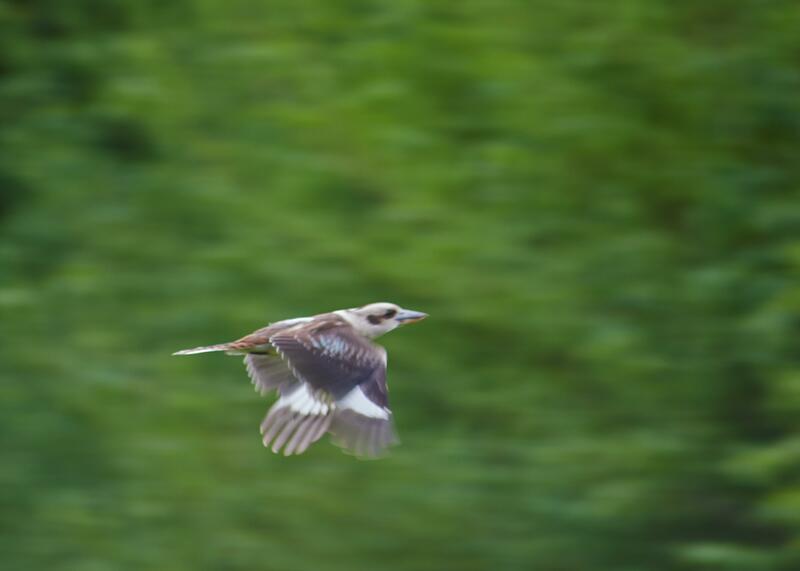 This panning shot of a Kookaburra was not something I planned on or had time to prepare for. I would have preferred a little less motion blur in the head. The conditions were not ideal as it was overcast with occasional showers. In hindsight, I could have bumped my ISO up to 800 instead of 400. Being able to change this at will is still something I am getting used to with digital. I usually leave it once I set it. Planning. This would vary based on what I wanted to accomplish. Sometimes there would be a plan B* as well. Check camera bodies or film backs** were empty. If loaded, use that first, if empty, reload with whatever film was required. Clean everything. Cameras, lenses and film backs inside out. Check everything. Batteries, light meter, camera settings, expiry dates on film, tripod etcetera. Packing. My average load was 10 kilograms (just over 22 US pounds). I was younger and more keen back then. Moving to digital has changed this checklist but the core activities remain. Planning. Still focussed on what I wanted to accomplish. There is a plan B and occasionally I throw in a plan C.
Clean camera and lenses. This is mostly an external wipe down. I get the CCD sensor cleaned if I see dust on it. Check everything. Batteries, light meter, camera settings, tripod and SD cards. I usually start with an empty card in the camera. Packing. My average load is 5- 9 kilograms (roughly 11-20 US pounds). I can explain this***. Honest! With planning, you can’t really be prepared for everything. I try to have one or two locations in mind if it is somewhere I have been before, otherwise I will use Google street view to plan a route through areas I think might have potential. If I have something specific in mind I will set the camera and lens up in advance to save time on site. If not, I will start out with a zoom lens and change on the fly. While I didn’t get the image of that Kookaburra in flight, it’s not all bad news. After all, I found a pair of Kookaburras that I can potentially go back to with the chance of getting something better next time. 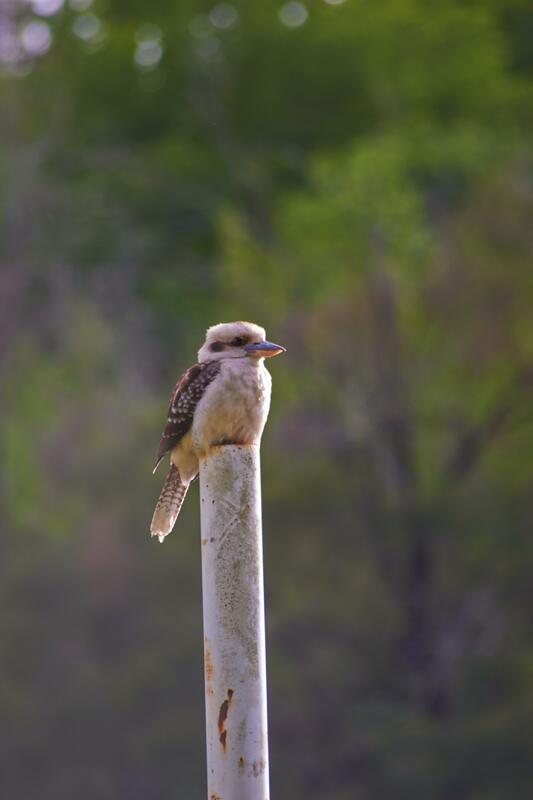 Here is the other one posing on a goalpost. *Always have a plan B. Nothing worse than getting out, finding the light you really wanted is not there and then having no options to work with what you have. **Since I couldn’t change film speed on a whim like I can now, an extra camera body or medium format film backs were essential. ***Most of the weight in any camera bag is lenses, especially zooms. That’s my excuse and I’m sticking to it! 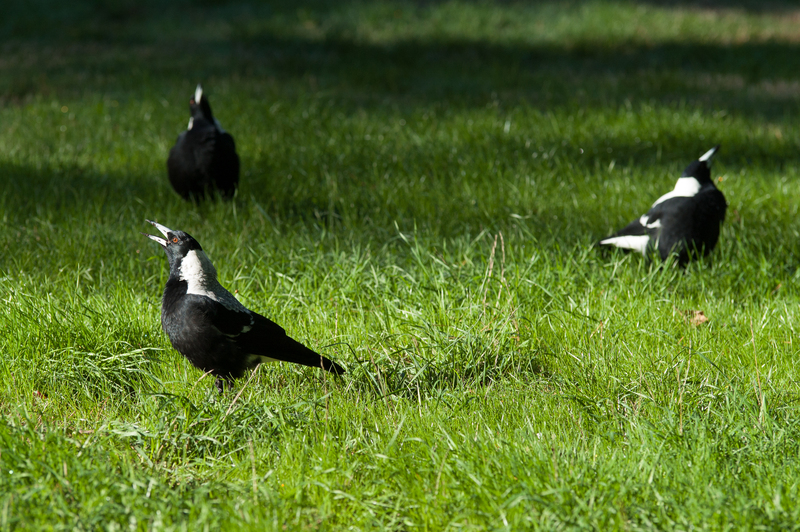 Walking through the Kyneton Botanic garden early in the morning when I noticed this group of Magpies start feeding. I picked a spot and waited to see if they would come closer toward me. I really wanted a close up of the head. The working distance got closer until they were all around me. That’s when everything came together and I made the title image. For me bark is like comfort food. It is easy to find and photograph and comes in an impressive number of varieties and forms and textures to explore. That also makes it the path of least resistance and the time I spend photographing bark could be used to get out of my creative rut.